Elana of Elana’s Pantry has some incredible almond flour-based recipes in her Almond Flour Cookbook. If you haven’t tried them, make a batch of Elana’s Chocolate Chip Cookies. Out of this world and egg-free, too! 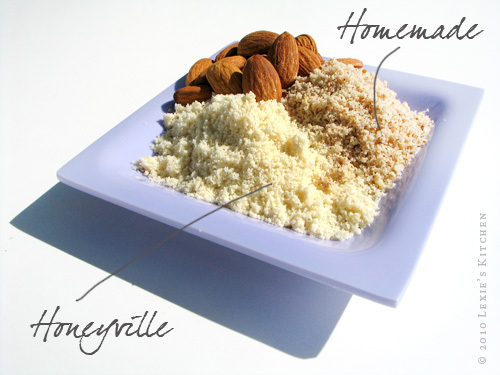 Elana and I both swear by Honeyville Food Products almond flour. It’s one of the finest ground almond flours out there. You can order it from Honeyville or pick some up at most Costcos. But what if mid-recipe you run out and need more? Here’s a solution. Get out a you coffee grinder. My coffee grinder is an older model of this one and has become one of the most essential gadgets in my kitchen. I reserve one solely for the purpose of grinding nuts and seeds. So if you have one hiding in the depths of your cabinet, pull it out, dust it off, and let’s start grinding some nut and seed flours. Here I compare storebought almond flour to a small batch I ground up myself. Had I used blanched almonds, my flour would have looked exactly like Honeyville’s. In the picture above I compare Honeyville to almonds I ground in a coffee grinder. I proceeded to make two batches of Elana’s gluten-free Snickerdoodles—from this cookbook—one with the freshly ground almond flour and one with Honeyville’s. No difference—in taste or texture. If you do a lot of baking with almond flour, it’s probably best to keep a bag of Honeyville’s on hand. However, if you only use it occasionally and in small measures (1-2 cups at a time), then give making your own a try. And there are tons of other flours you can grind up at home, too! Chia Seed: Due to my son’s egg intolerance, I bake with chia eggs. To make a chia egg I grind white chia seeds in the coffee grinder and mix with water (here’s a post on chia and how to make a chia egg). Flax Seed: Another great foundation for an egg replacer and a nice flour to add to baked goods. What to make with it: Kim Wilson’s Soaked-Grains Flatbread over at Whole Life Nutrition Kitchen is incredible! Pumpkin Seed: Makes a great flour. I throw some into my pancake batter for added protein. What else to make with it: I’ve been wanting to try Maggie’s Pumpkin Seed Chocolate Chip Cookies. Walnuts, Cashews and Pecans: A great addition to baked goods. With softer nuts like these, be careful not to over grind or nut butter will be the result. What to make with it: Grain-Free Breakfast Porridge over at Diet Dessert and Dogs. Hazelnuts: An alternative to almond flour. What to make with it: My Gluten-Free, Grain-Free, Egg-Free Hazelnut Brownies. 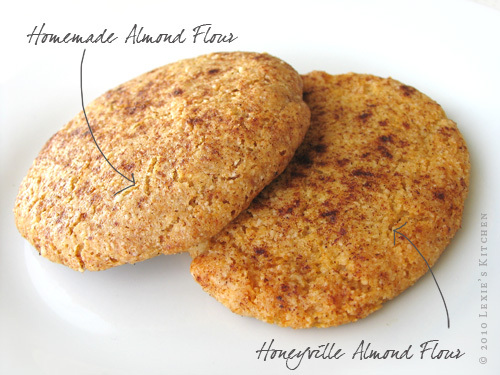 Almonds: What to make with it: Any of Elana’s Pantry’s almond flour-based recipes! Buckwheat and Quinoa: A great addition to baked goods. Some prefer to sprout/soak, dehydrate and then grind. Spices: And don’t forget to use that coffee grinder for grinding up whole spices like cumin, coriander, peppercorns and small pieces of cinnamon stick. Fill a coffee grinder 1/2 to 3/4 full (maxmium) with raw nuts or seeds. Grind until you have a nice, fluffy flour. If the grinder sounds like it is slowing down, check to see if a nut or seed is lodged under, or stuck on, the blade. Dislodge and off you go. Repeat until you have the amount your recipe calls for. Pick out chunks and grind again or toss. Sifting the flour is optional, but ensures a consistently fine flour. I picked up a gently used turn-handle flour sifter at Goodwill (is it any secret how much I love that store?) much like this one. It worked like a charm to sift out the larger bits of hard nuts like almonds. Avoid the multiple screen style sifters like this one. I tried one and it made for a big headache. Store any unused flour in an air-tight container in the fridge. I suggest purchasing a separate coffee grinder for this task. I have not repeated it hundreds of times and don’t think it would damage a grinder, but at the same time I don’t want to be responsible for damage done to anyone’s precious coffee grinder. 🙂 Grind flour at your own risk. Thanks! This is so useful, I often run out of one flour or another, great to have a guide to make my own! Have shared your post on my Facebook Page! i HAVE used it 100's of times for this purpose, and it is still going strong!! The blades are getting a bit worn, but after 7 years of ownership, I figure it is expected~! I've got a post on this too! I always use my coffee grinder to make flours. In fact, I bought Honeyville and did a side-by-side comparison and EVERYONE preferred the batch made with my home grind, so now I just do it at home and don't buy the premade flours. I find it most useful for grinding cashews. Wow! How great. I have soooo many gf, nut flours that I don't use because I am so not a great baker but tempted when I read all of the blogger girl posts. Everything looks so yummy. Jolene, thanks for the share! Oooh! I never thought to grind pumpkin seeds – what a great idea! Hey Lexie, why is the almond flour you ground a darker color than the Honeyville? Ellen, in the post I suggest that you can opt to blanch the almonds or grind with skin on. I ground with the skins on … so the brown skins make the flour darker. If you blanch the nuts, dry and grind the flour comes out like Honeyville. The key is to ensure the nuts are completely dry prior to grinding. Pour boiling water over nuts and let sit for a a few minutes until skins soften. Peel skins off (or I rub between layers of a terry cloth dish towel). Allow to dry completely before grinding. Thanks so much for these great ideas. They will really come in handy. I haven't figured out the cost yet, but I bet it is so much less money to make your own flours. Can't wait to try it! Has anyone tried making flour from pine nuts? Are they too oily? I think they would lend a great flavor to Italian type breads and focaccia. Great post! I love pumpkin seed flour, and make tons of my own flours, but here is what I do: I make a fresh nut/seed milk every morning. Pulp of the seed/nut is left over after making the milk. I spread the pulp out on a piece of parchment paper and dry it out in a very low temp oven. Once the pulp is dry, I store it in the freezer, grind it in a food processor when needed for flour. Works great! I have nut allergies so I was wondering how to make pumpkin flour. Could I use a food processor to make the flour? Also, do I just use raw pumpkin seeds? Brandi, You can do pumpkin seeds the same way. Not sure how fine you'll get using the food processor, but it is worth a try. As with nuts, you don't want to blend to the point that you begin generating heat … that is when you begin to make nut/seed butter 🙂 And yes. Raw seeds.